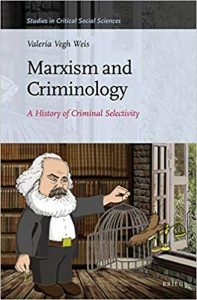 In Marxism and Criminology: A History of Criminal Selectivity, Valeria Vegh Weis rehabilitates the contributions and the methodology of Marx and Engels to analyze crime and punishment through the historical development of capitalism (15th Century to the present) in Europe and in the United States. The author puts forward the concepts of over-criminalization and under-criminalization to show that the criminal justice system has always been selective. Criminal injustice, the book argues, has been an inherent element of the founding and reproduction of a capitalist society. At a time when racial profiling, prosecutorial discretion, and mass incarceration continue to defy easy answers, Vegh Weis invites us to revisit Marx and Engels’ contributions to identify socio-economic and historic patterns of crime and punishment in order to foster transformative changes to criminal justice. The book includes a Foreword by Professor Roger Matthews of Kent University, and an Afterword written by Professor Jonathan Simon of the University of California, Berkeley.